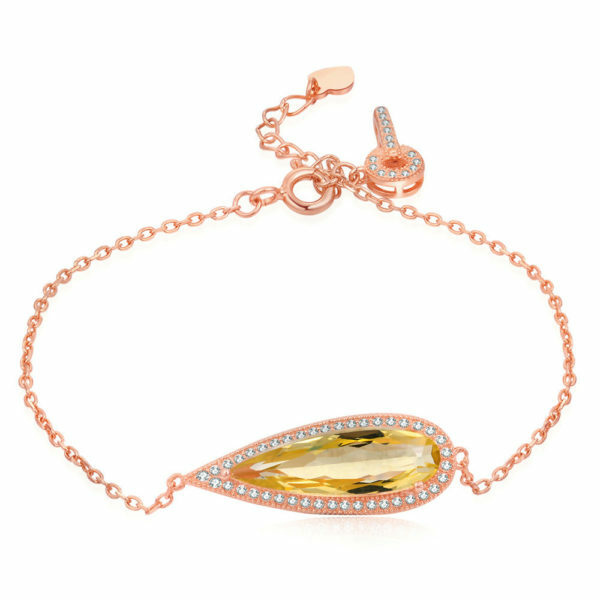 Attention-getting Waterdrop charm bracelet with carefully selected 10x26mm waterdrop-shaped natural yellow citrine gemstone. Made of 18K rose gold plated and hand polished 100% real sterling silver. The citrine gemstone feels solid and is cut perfectly! Sparkles in the light. The rose gold is a pretty color and the settings feel like they are well made. I love the little crystal embedded key charm at the clasp. It’s a classy added touch! I’ve expected it earlier, but the bracelet looks awesome! Very original and sophisticated piece of jewelry. Feels and looks genuine, just as claimed by the seller. I feel fancy when I wear it. Was going to give it to my mom, but then fell in love with it. Packaging was very well thought out! The seller sent it in bubble wrap protected envelope, more bubble wrap, a cute little box with a bow and flower, and a velvet pouch. It came with the material details written out and also a silver polish cloth. It really felt like a gift! Thank you!! Also, the tracking and seller communication was good. It was delivered early, in about 2 weeks. They were careful not to leave in the mailbox, so nobody would take it. Bracelet was better than I expected. For the price I was expecting it to be more of a costume jewelry piece, but it is really well made and elegant! My favorite piece of jewelry I own now. I just need more rose gold jewelry from the seller to match! Un excelente vendedor, con piezas de gran calidad, aun más bonito que en la foto, 100% plata de ley, MUY RECOMENDABLE !!! !